Do you have lots of emails in your Outlook? Most people are, especially those in business. Many personal emails can be deleted, but business correspondence needs to be saved. You never know when you might need to refer to them. So what happens? You end up with lots of emails that keep increasing with time. And the more emails you have in Outlook, the slower your work becomes. Then how do you solve this problem? 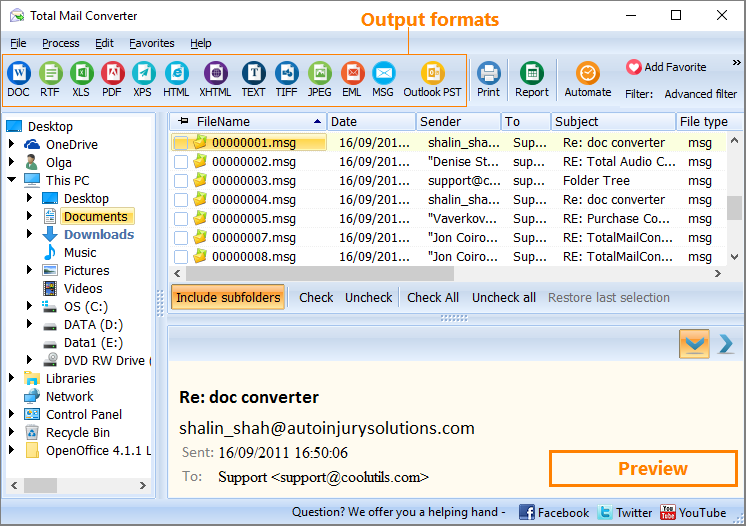 The problem can easily be solved with Total Mail Converter. 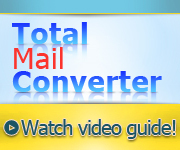 Total Mail Converter is an easy to use tool developed especially for this purpose. Now you can export emails from Outlook to MSG or EML files and then easily convert your files to HTML, TXT, PDF, DOC, and RTF files. 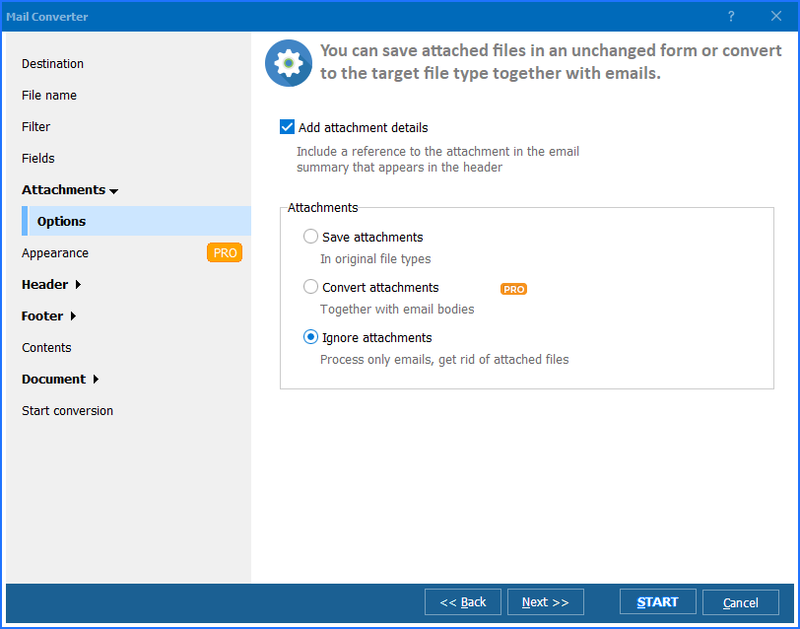 Open Total Mail Converter and select the Outlook message, or messages (.msg, .eml, or any file), that you need to convert. Click on the format of your choice. A dialogue box will pop up. You can either click on Start and convert right away, or click on Next. If clicked on Next, you will have the option to select the fields that you wish to export - sender, recipient, date, subject, body. You may select one field, or more than one, depending on your choice. Again you may either ‘Start’, or click on Next and go to the option of selecting the document information that you wish to save – author, creator, keywords, subject, title. Yet again the option is to either ‘Start’ or have the option of selecting the compression level- fastest, normal, maximum. You may even encrypt your document to protect it if you so desire. Finally ‘Start’ and your file is saved. 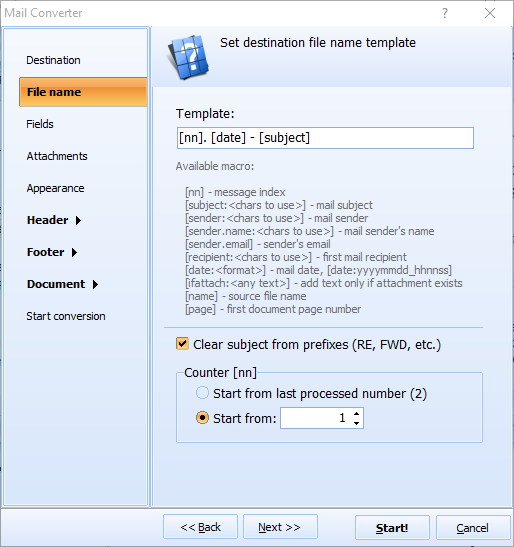 Selection of the format that you wish your email to be converted to depends on how you are going to use the file later on. For instance, export MSG to TXT if you want to work on Notepad, MSG to RTF if you require rich text, MSG to DOC enables you to work on Word, and so on. These converted messages can now be saved in folders on your computer. If there are attachments in emails, they can be saved as well. Now your Outlook looks much neater with fewer emails. Work becomes much faster, and you have your emails saved for reference as well.